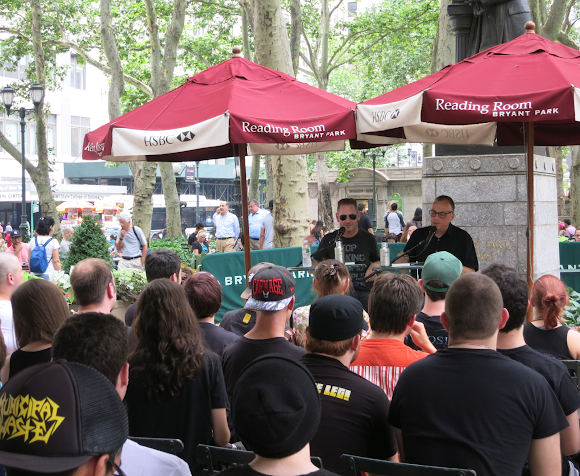 Corey Taylor (left) and Lou Brutus (right) chat about Taylor's new book and life as the lead singer of Slipknot. Lead singer of Slipknot and Stone Sour, Corey Taylor and Rock Radio Host, Lou Brutus, stopped by the Bryant Park Reading Room last week to talk about Taylor's new book, You're Making Me Hate You. Taylor's book opens the readers to the many things in life that bother him. Whether it be rude behavior in malls and restaurants or clueless drivers, the book is sure to bring a few laughs. Lively and entertaining commentary on Westerns in Film. With resident film expert Scott Adlerberg and cineaste Dennis Tafoya. BookClub discussion on The Divine Comedy by Dante Alighieri. Facilitated by Joseph Luzzi, In a Dark Wood. A Conversation with today’s most buzzed-about novelists. The first person to say "Novel Novelists" to the Reading Room Coordinator at the event will win a free copy of the book.